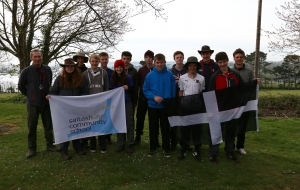 A huge congratulations to the two teams of saltash.net students who successfully completed the Ten Tors Challenge this past weekend. Both teams were made of six students, and completed the 35 mile route. Unfortunately, team B member Seb Frost left the group on Saturday night due to a leg injury, with Seb himself deciding to withdraw rather than slow the group down. Seb left the group at the Postbridge Safety Checkpoint, around 15 miles into the challenge. saltash.net Team A – James Randall, Charlie Potts, Zak Newell, George Seymour, Megan Seymour and Ethan Cox. saltash.net Team B – Danny Snook, William Oatey, Jack Pritchard, Seb Frost, Michael Larkin and Harry Pascoe. Headteacher Mrs Bryce congratulated the teams and praised the work of staff members Graham Drewery, Gareth Jones and Kirsty Newberry, who trained and prepared the students for the challenge. The challenge was the culmination of seven months of training, as the students started to prepare last October. Once again, well done to all involved, both staff and students, on a successful Ten Tors Challenge.